In 2009, the RBG Seed Bank began collecting seeds from native plants growing at our site in Tal Al-Rumman. 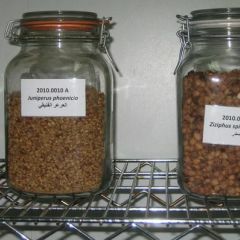 So far, we have amassed seed stocks for approximately 180 plant species of Jordan. 2. Collect and preserve the seeds of all native Jordanian plant species. We are currently preparing a Protocol for Seed Collection setting out all guidelines for our seed bank operations, including what seeds are collected, where and how; seed priorities; germination tests; and treatments for seeds before storing in the freezer. Most seeds are dry and need no special treatment before storing. However, some seeds first require oven curing or are kept for a while in an incubator before being stored in the Seed Bank freezer. For short-term preservation, all seeds are kept in a walk-in freezer at temperatures between 0º C and -10º C. Long-term conservation requires even colder temperatures. Our seed stocks are tested every year for viability. The stocks are constantly updated and replenished with fresh seeds. The RGB Seed Bank is collaborating with Jordan's universities to find and preserve the seeds of all plants in the Kingdom. This is a formidable task as over 2,500 plant species are known to grow in Jordan, of which approximately 800 have already been found within the perimeters of the RBG. The Seed Bank has received funding from the Agence française de développement.